We’ve conducted an Online Video Barometer, in partnership with OnePoll, that has uncovered the huge power of Online Beauty Videos amongst 16-45 year olds* and warns beauty brands to tap into video now or risk losing out on Christmas sales. 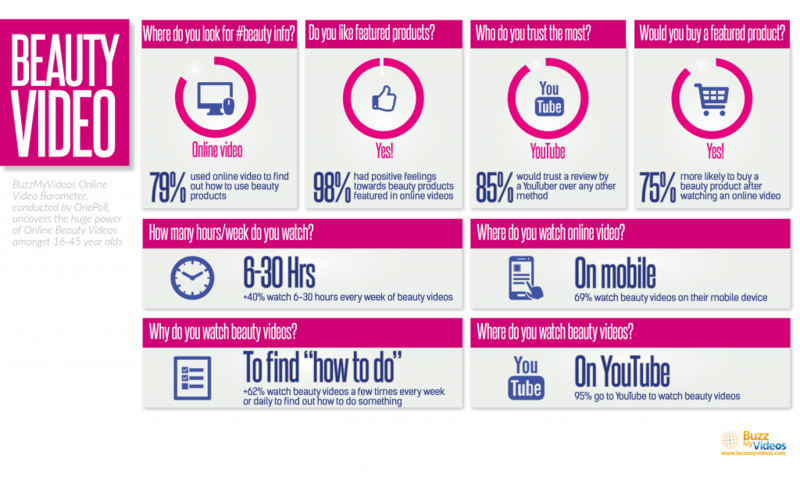 The results of the BuzzMyVideos Online Video Barometer, conducted independently by OnePoll, have revealed an incredible consumer affiliation towards Beauty Vloggers (#bvloggers) on YouTube with 98% of respondents reporting positive feelings towards beauty products featured in online videos watched. Its closest rivals, TV and Radio adverts, took a mere 4% of the votes followed by magazines with 2%. It has also been revealed that nearly half of all respondents turn to online beauty videos to find out how to do something at least a few times a week. The beauty market was worth a whopping £17 billion in 2014 and is forecasted to rise by 16% by 2016. ** With trust in YouTubers sky high and Christmas just around the corner, the smartest beauty brands will be tapping into online video to increase their slice of this sizeable pie as the competition becomes increasingly fierce. Beauty is a highly personal, emotive sector. Engagement and trust in products play a huge part in the purchasing decisions of consumers. Traditionally this has been led by household name celebrities and models fronting huge ad campaigns. Today there has been a shift in consumer behaviour, in particular in the beauty sector where trust and recommendation are crucial in the buying process. Public perception of online video has evolved alongside a maturing market. Our Online Video Barometer has revealed an incredible level of trust with YouTubers across many sectors but Beauty stood out as an area of particular strength. The results come as a clear warning to the beauty industry as key players ramp up sales and marketing for the all important Christmas season. The credibility of YouTubers among consumers marks a clear cultural shift and one which beauty brands need to very quickly switch on to. As the Christmas season commences, those who have innovated in this area with creative strategies involving YouTubers will find themselves reaping huge rewards. Which platforms are consumers using to view their favourite beauty content? According to the BuzzMyVideos Online Video Barometer, 96% of respondents opt to view beauty videos directly on YouTube followed by Facebook with 25% of the votes. Other publishing platforms received a mere 2% of the vote. 62.5% of beauty fans view their videos on desktops and a huge 69% via their mobile devices.